Aaloo poori have since time immortal (lol) been an option for a wonderful, wonderful heavy breakfast on weekends in our house in India. This recipe I adopted from my mom, and I call it "poori waale aaloo".. because I strictly believe that what goes with this sabzi is only hot, fluffy pooris; nothing else, even though my husband is perfectly okay with having chappati as well with this, but I totally am not. 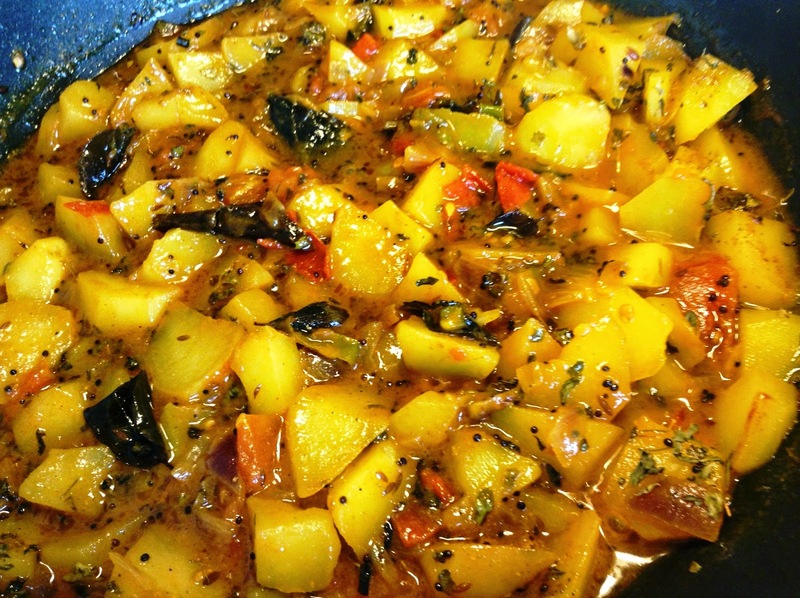 Here I'm sharing my fool-proof recipe for the aaloo sabzi. It can be savoured with Puffed Poori. This also makes a wonderful pack and carry lunch for places where Indian food is hard to find or while travelling or on excursions, also making kids happy, and can even be eaten cold and tastes just as wonderful. Just remember to add the minimum water while packing it for carrying along. Heat oil in a shallow pan over medium flame. When hot, add mustard seeds. Let them splutter for 5 seconds. Then add cumin seeds, and let it also cook for 5-10 seconds. Add curry leaves and chopped green chilli. Let it cook for about 30 seconds. Add onions and sauté them till translucent. Don't let them brown. Add chopped potatoes and then add salt to taste and turmeric powder over them. Mix them thoroughly and let them cook for about a minute. Add a cup of water (medium), cover the pan and let the potatoes cook until they are soft. Open the pan when most of the water is absorbed. Add chopped tomatoes and mix well. Add red chilli powder, mix and let it cook for another minute on low flame. The water will further be absorbed and it will start becoming a semi-liquid. Add mango powder and garam masala over it and mix it well. Garnish with freshly chopped coriander leaves and server hot with poori. You might also add lemon juice over the aaloo when cooked (before garnishing) to give it a tangy taste.